Welding cable size conversion help you choose the right wire size between American wire gauge and variety of other sizing standards. Both cable gauge and length affect welding cable ampacity. However, cable length is determined by where you need electric power to go. If you need a 20 foot cable to power some equipment there is no getting around that, but you always have options regarding wire thickness, or welder cable size. Thicker wires (e.g. 2 AWG is thicker than 6 AWG) and shorter cables can handle more current than thinner wires and longer cables. For example, a welder cable sized at 2 AWG can handle more current than one sized at 6 AWG, while a 6 AWG cable can handle more current than one sized at 28 AWG. Similarly, if the thickness of the copper conductors are the same, then a cable that is 10 ft long can carry more amps than one that is 20 ft long, but will carry less than one that is 9 ft long. In terms of cost, longer cable is more expensive than shorter cable, and thicker wires (smaller gauge numbers) are more expensive than thinner ones. Also, since longer cables carry less current you will need thicker wires to compensate for the cable's reduced ampacity. Shorter cable can carry more current, so you can use thinner wires. 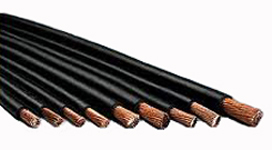 TEMCo welder cable sizes are listed with American Wire Gauge (AWG) ratings or in circular mil. See welding cable size chart for examples of welder cable sizes we offer. 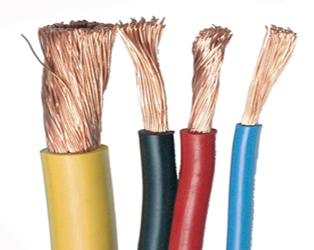 AWG is popular in the U.S. and Canada for welder cable size and electrical wires in general. The British Standard Wire Gauge (SWG) is another gauge system that was used in the past, but has been gradually displaced by the AWG. A mil is a length of 0.001 inches, and cmil stands for "circular mil" and is equivalent to the area of a circle 0.001 inch in diameter (see welding cable size for more information). For cables larger than 4/0 sometimes kcmil will be used instead of 5/0, 6/0, etc. A kcmil, or kilo-cmil, is the area equal to a circle that is 1 inch in diameter. For example, a 250 AWG cable means it has a cross-sectional area equal to 250 circles that are 1 inch in diameter. Since the same gauge number refers to different wire measurements in different standards, it is useful to know what welder cable size you need (cross-sectional area for stranded wire and diameter for solid wire) in mm or inch to avoid possible confusion with different gauge systems. If you are using wire from a different gauge system you should refer to a gauge conversion chart. The chart below gives conversions for four common gauge standards used in the U.S. Typically, a gauge standard is used by a particular industry. For example, electrical wires in the U.S. are commonly rated according to AWG, while the steel industry likes to use Washburn and Moen (W&M). Also, the gauge standard may change depending on what you are in. 4/0 .3938" .400" .454" .4600"
3/0 .3625" .372" .425" .4096"
2/0 .3310" .348" .380" .3648"
1/0 .3065" .324" .340" .3249"
1 .2830" .300" .300" .2893"
2 .2625" .276" .284" .2576"
3 .2437" .252" .259" .2294"
4 .2253" .232" .238" .2043"
5 .2070" .212" .220" .1819"
6 .1920" .192" .203" .1620"
7 .1770" .176" .180" .1442"
8 .1620" .160" .165" .1284"
9 .1483" .144" .148" .1144"
10 .1350" .128" .134" .1018"
11 .1205" .116" .120" .0907"
12 .1055" .104" .109" .0808"
13 .0915" .092" .095" .0719"
14 .0800" .080" .083" .0640"
15 .0720" .072" .072" .0570"
16 .0625" .064" .065" .0508"
17 .0540" .056" .058" .0452"
18 .0475" .048" .049" .0403"
19 .0410" .040" .042" .0358"
20 .0348" .036" .035" .0319"
21 .0317" .032" .032" .0284"
22 .0286" .028" .028" .0253"
23 .0258" .024" .025" .0225"
24 .0230" .022" .022" .0201"
25 .0204" .020" .020" .0179"
26 .0181" .018" .018" .0159"
27 .0173" .0164" .016" .0141"
28 .0162" .0148" .014" .0126"
29 .0150" .0136" .013" .0112"
30 .0140" .0124" .012" .0100"
31 .0132" .0116" .010" .0089"
32 .0128" .0108" .009" .0079"
33 .0118" .0100" .008" .0070"
34 .0104" .0092" .007" .0063"
35 .0095" .0084" .005" .0056"
36 .0090" .0076" .004" .0050"
37 .0085" .0068" - .0044"
38 .0080" .0060" - .0039"
39 .0075" .0052" - .0035"
40 .0070" .0048" - .0031"
Why is welder cable size important?